When trying to lose weight, it’s not about what the scale says - it’s about how the clothes fit. The same goes for the operations of your business. 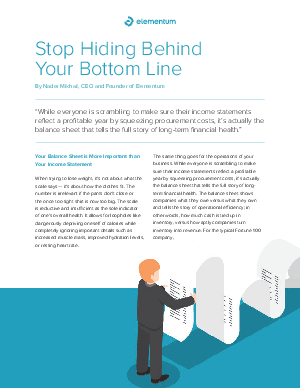 While everyone is scrambling to make sure their income statements reflect a profitable year by squeezing procurement costs, it’s actually the balance sheet that tells the full story of long term financial health. The problem is, no one can see the whole picture with enough resolution to lose the weight. Instead, terrified of stock outs or missing out on sales opportunities, companies inundate their operations with buffer, while desperately squeezing supplier margins in a scramble. This strategy is not only limiting - it’s financially short sighted. Learn how your operations can unlock the flow of information, allocate materials in real time, and optimize cross-functional collaboration. Because an inevitable consequence of a healthy balance sheet - is a profitable income statement.